Enveloped, spherical, icosahedral, 65-70nm in diameter, capsid with a T=4 icosahedral symmetry made of 240 monomers. The envelope contains 80 trimer spikes, each spike = 3 x E1/E2 heterodimers. Monopartite, linear, ssRNA(+) genome of 9.7-11.8 kb. The genome is capped and polyadenylated. 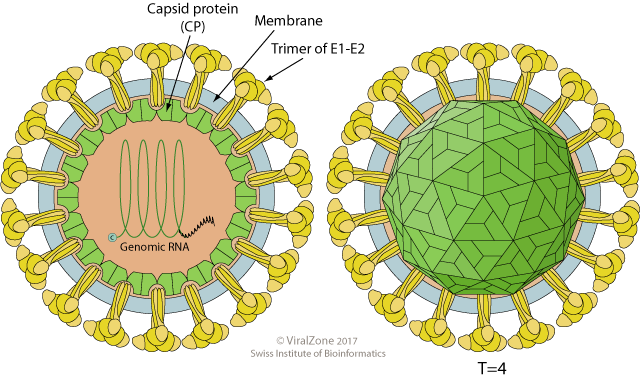 The virion RNA is infectious and serves as both genome and viral messenger RNA. The whole genome is translated into a non-structural polyprotein which is processed by host and viral proteases. Structural polyprotein is expressed through a subgenomic mRNA. In alphaviruses, RdRp is expressed by suppression of termination at the end of 10% of nsP polyproteins. Moreover a ribosomal frameshifting in the 6K region induces the translation of the TF protein in alphaviruses. Attachement of the viral E glycoprotein to host receptors mediates clathrin-mediated endocytosis of virus into the host cell. Fusion of virus membrane with host endosomal membrane. RNA genome is released into the cytoplasm. The positive-sense genomic ssRNA is translated into a polyprotein, which is cleaved into non-structural proteins necessary for RNA synthesis (replication and transcription). Replication takes place in cytoplasmic viral factories at the surface of endosomes. A dsRNA genome is synthesized from the genomic ssRNA(+). Expression of the subgenomic RNA (sgRNA) gives rise to the structural proteins. Capsid assembly occurs in cytoplasm. The capsid is envelopped by budding at the plasma membrane where the virion exits the cell. NATURAL HOSTS Human, mammals, marsupials, birds, mosquitoes. SINV: heparan sulfate, High-affinity laminin receptor. ASSOCIATED DISEASES Alphaviruses: Arthritis, Encephalitis. Chikungunya probably activates an autophagic process which promotes viral replication . Togaviruses mediate host translation shutoff. Alphaviruses induce strong PKR activation leading to leading to the almost complete phosphorylation of eIF2alpha and host translation arrest . Rubella virus capsid protein (Rubivirus) seems to mediate host translation shutoff by inhibiting host poly(A)-binding protein . Alphaviruses perform host transcription shutoff by inhibiting host RNA polymerase II. Host RNA-pol II catalytic subunit is targeted for degradation as early as 4-6h p.i. .